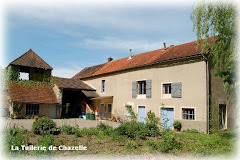 Since I have discovered that our village Chazelle once was a doyenné belonging to Cluny I have been trying to figure out what exectly a doyonné is. The dictionary simply gives the word "deanery". Wikipedia is a bit clearer. A deanery (or decanate) is an ecclesiastical entity in both the Roman Catholic Church and the Church of England. 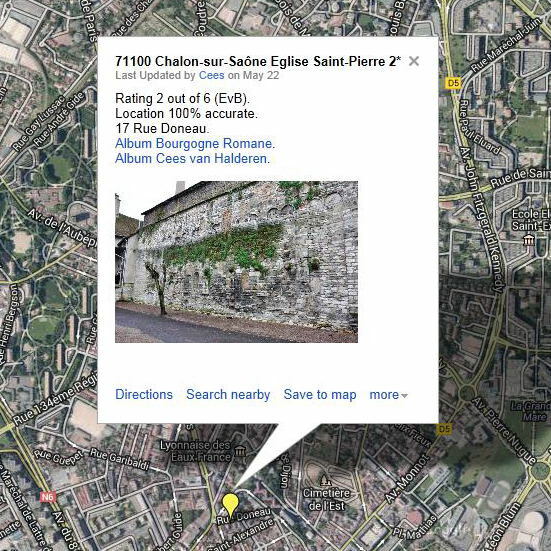 A deanery is either the jurisdiction or residence of a Dean. It appears that a doyenné consists of a number of parishes. 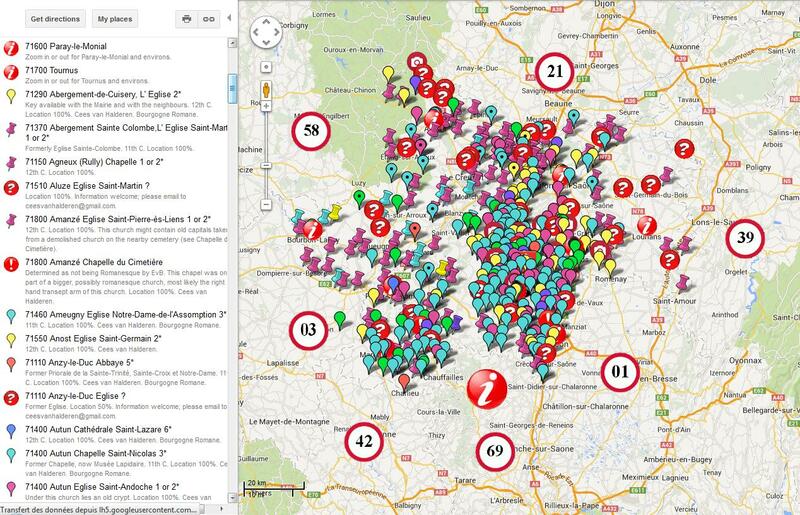 I also found out that around Cluny there had been a disproportional number of deaneries. 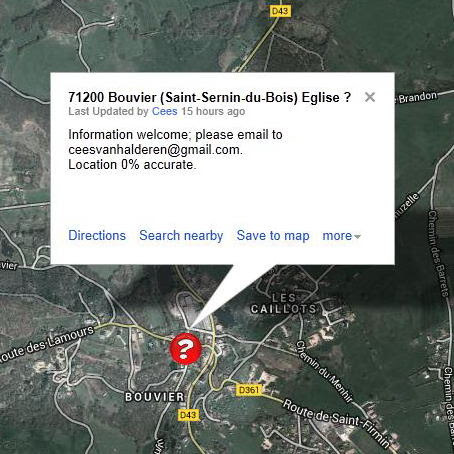 To mention a few : Saint-Hippolyte, Bezornay, Jalogny, Chazelle, Mazille... They are all within a circle with a radius of 15 km. Of course Wikipedia is not the only source of knowledge, and reading a book about Cluny, I stumbled upon a different and more logical definition of a doyenné: a doyenné is an agricultural unit, providing an abbey with agricultural products. According to this definition the big number of deaneries around Cluny seems all of a sudden very plausible and logical. 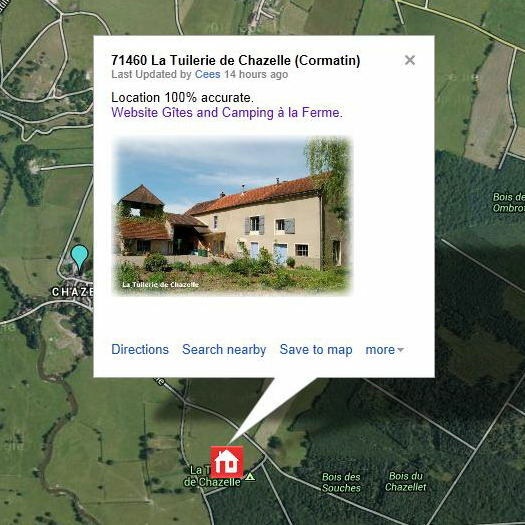 In the hamlet of Bezornay, near Saint-Vincent-des-Prés, is such a doyenné. We had visited the building in the past, but we had not found much more than a piece of defence wall with a tower and a gate, and at the gate a sign "No entry, work in progress". From the entrance the recesses for a drawbridge were clearly visible. When we came here for the second time there was nobody around, so I peeked in through the gate. 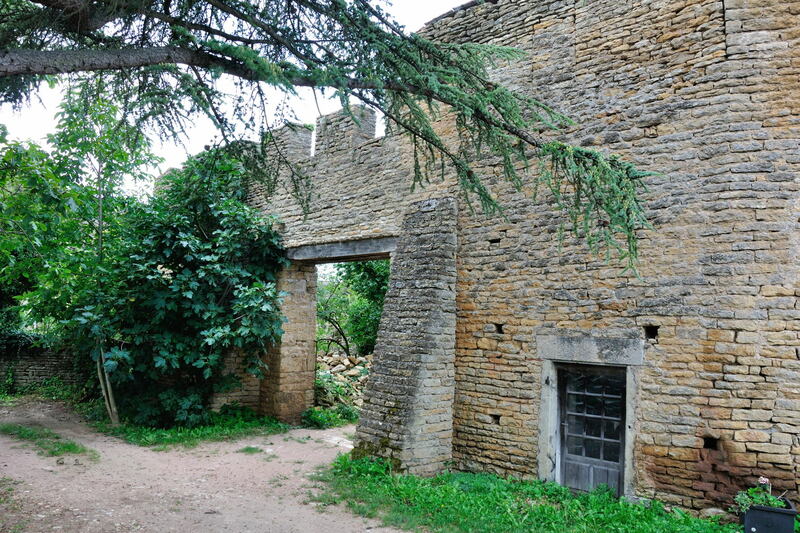 I noticed a crenellated wall, and within the walls stood a house. In order to have a look at the house itself I did not have trespass or to break any laws; when I walked down the path along the property I had a clear view of the house and former chapel. 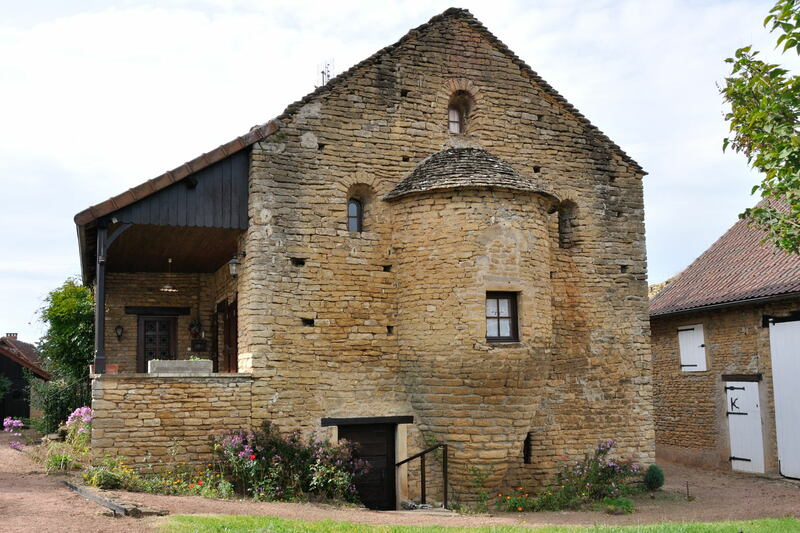 The chapel had on the outside a rather strange extension; an apse in the shape of a "demi-cône renversée" (reversed semi-cone). This type of construction had been employed in the past inside Cluny III, and in the church of Semur-en-Brionnais something similar can still be seen. 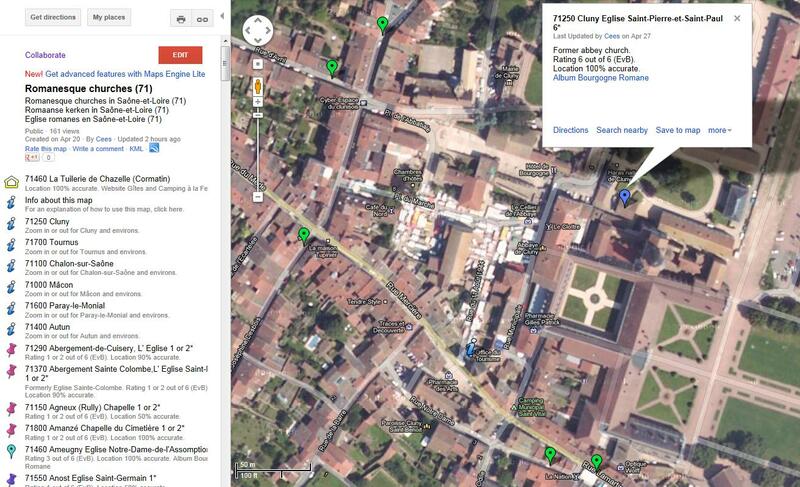 I do not make this up; my knowledge comes straight away from Le site sur l'Art Roman en Bourgogne. This site, by the way, also has a very handy glossary of terms used in Romanesque architecture, of which I have made an illustrated English translation. With some pride I can announce, that not only my pictures have been added to the aforementioned site, but also that the definition of doyenné has been slightly changed to reflect the agricultural meaning of the word. 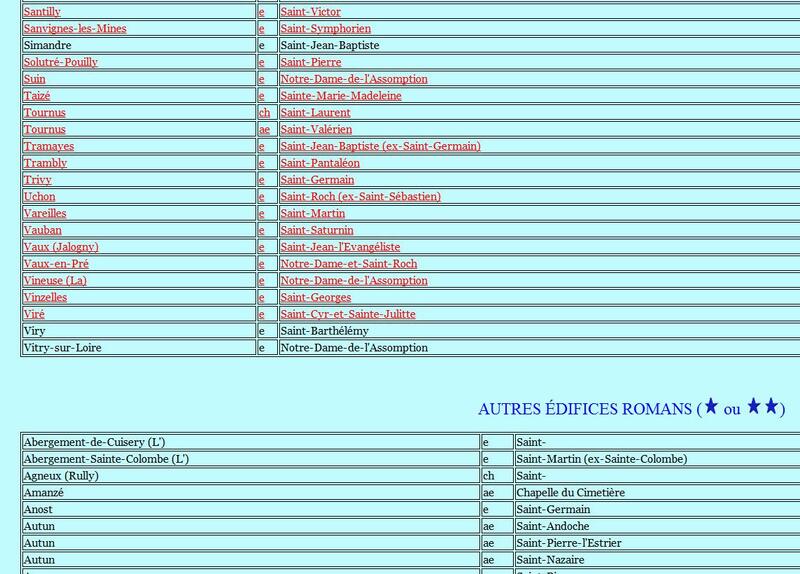 Part of the list of churches on "Le site sur l'Art Roman en Bourgogne"
Ever since I have been looking for information about Romanesque churches in Burgundy, I am using "Le site sur l'Art Roman en Bourgogne" more and more often. This is mainly because the site contains a lot of information on the subject. And since I am quite interested in this subject, I spent more and more time on that site. 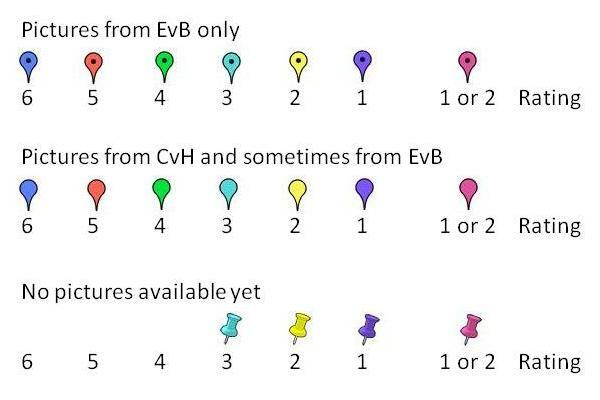 And indeed, one day I thought "Would it not be handier if there was also a map available, where one can see very quickly what a certain area has to offer?". An email to the webmaster told me that he would like to have this feature as well, but that he had not gotten around it yet. 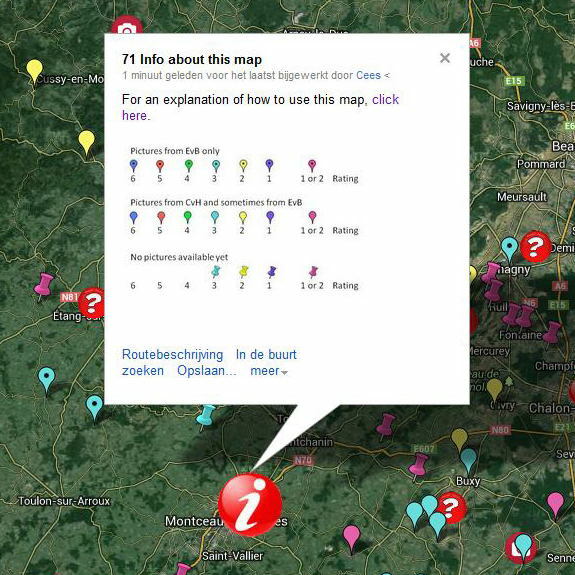 As a workable alternative I changed my database of churches such, that I could sort that database on specific areas as well, instead of only alphabetically or on rating. 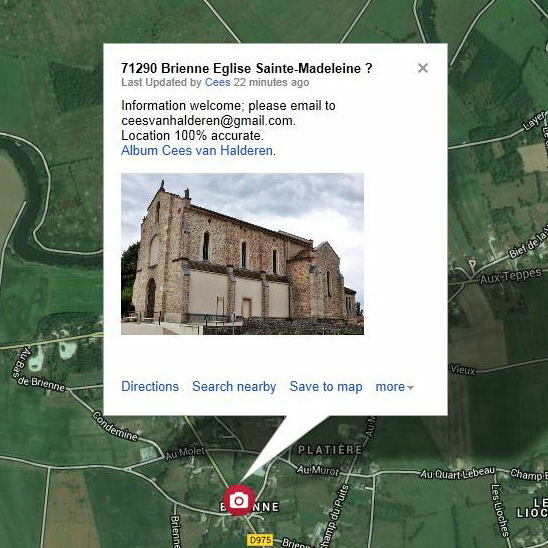 A list with churches in the vicinity of e.g. 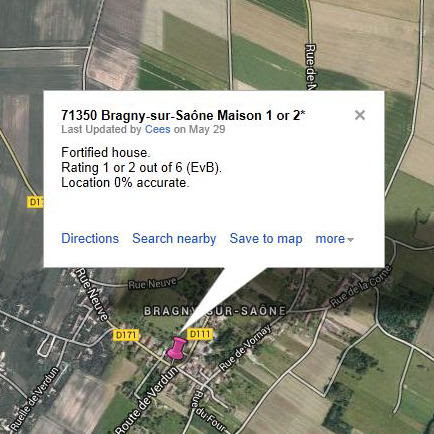 Montceau-les-Mines could be generated very quickly. 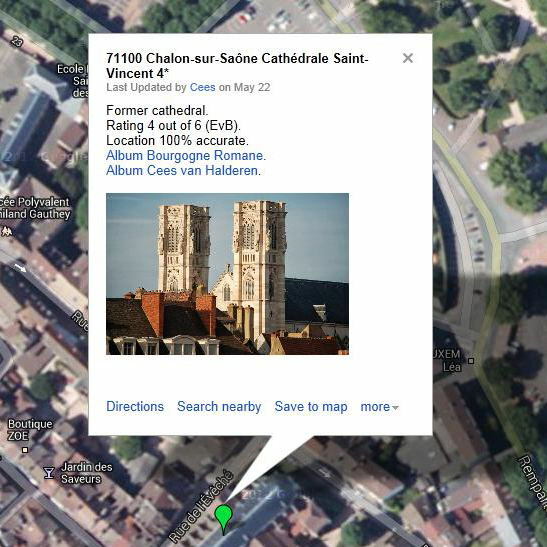 One day my better half bumped into an option of Google Maps. Although making an interactive map was a lot of work, it was certainly doable and not very difficult. 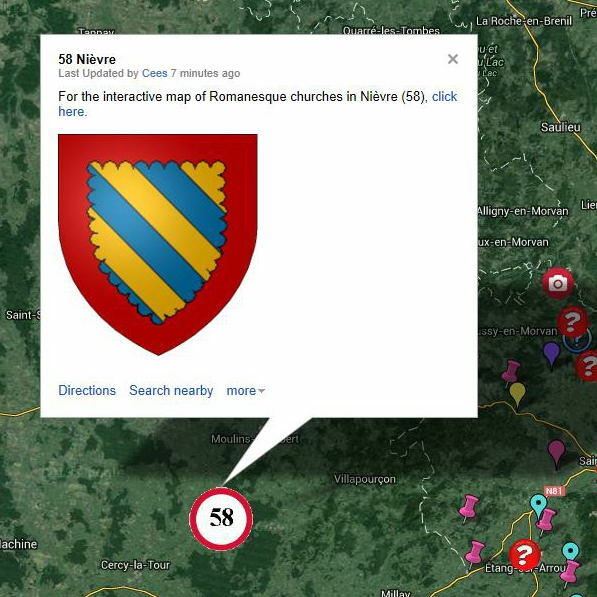 After a number of days hard work I now am the proud owner of an interactive map of "all" Romanesque churches in Saône-et-Loire. 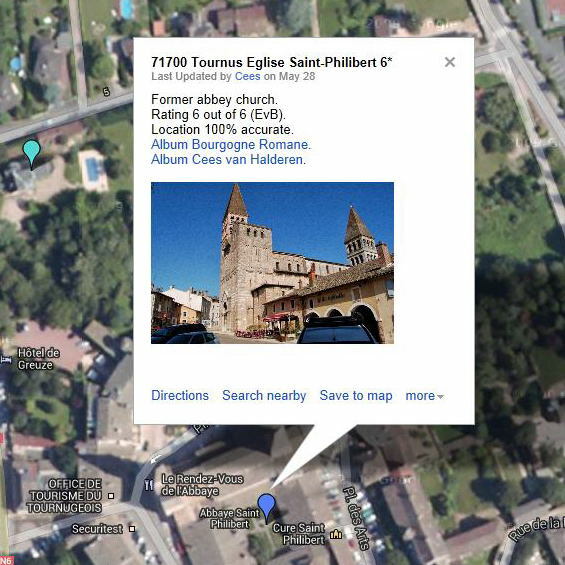 I can now pinpoint easily and quickly all churches in a certain area, find out how they are classified and find pictures of them. 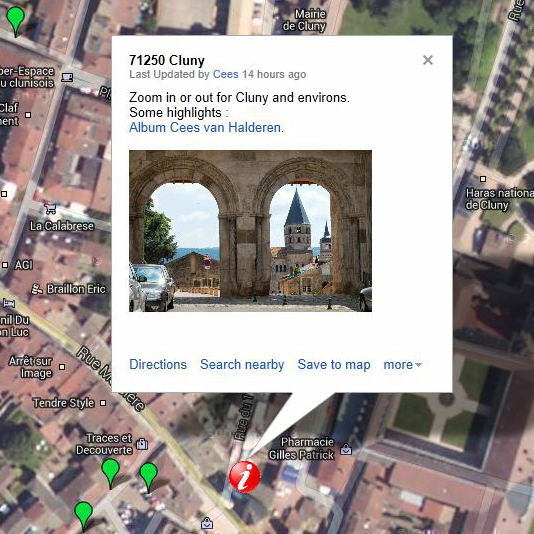 In a following blog a short explanation of how to use the map will be given. And what about the rest of Burgundy? I gladly leave that chore for someone else! 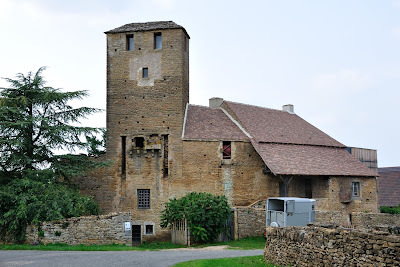 For the umpteenth time on our way to the church in Saint -Maurice-de-Satonnay in order to see a wall painting in the (non-Romanesque) Sant-Denis we passed through the hamlet of Satonnay. 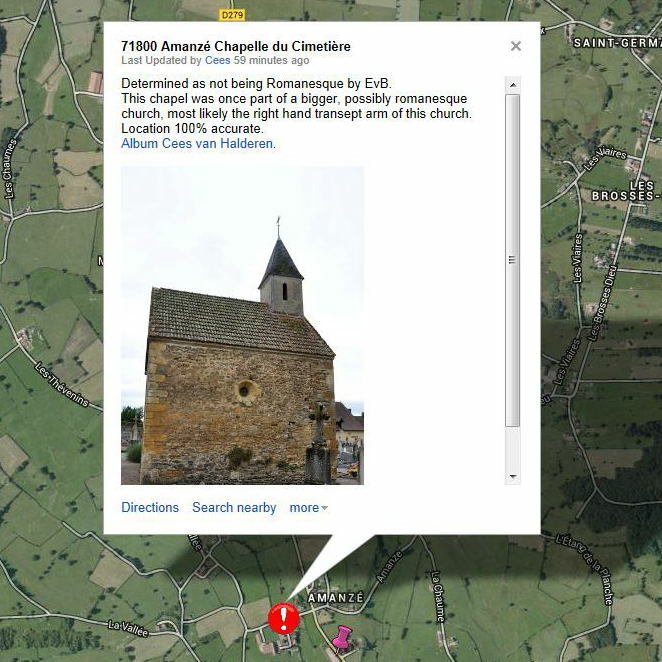 There seems to be a curse on this particular visit, because every time we go there we find that church shut. 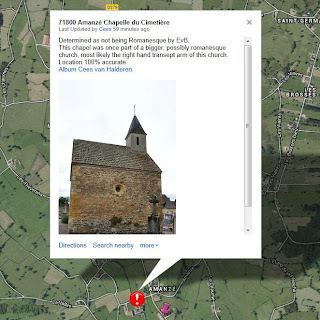 Firstly, this was the church of Satonnay, not a chapel. 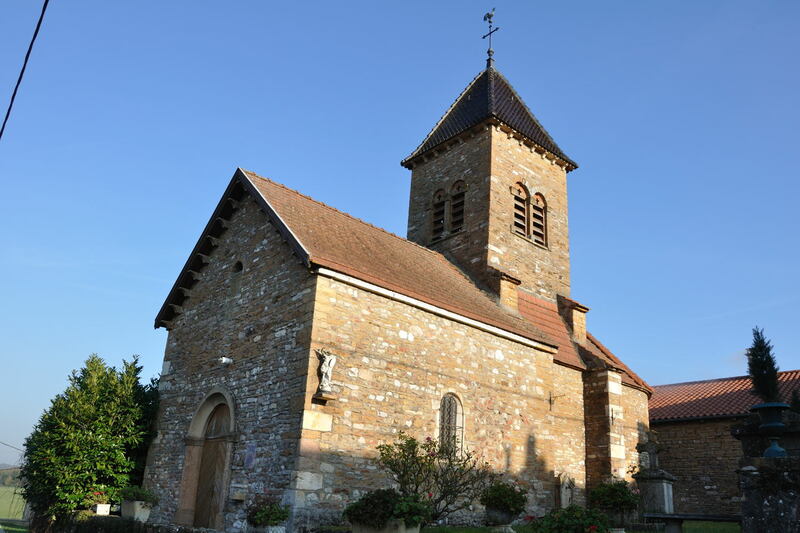 The church was built in the 10th century, and had been regularly altered over the centuries. 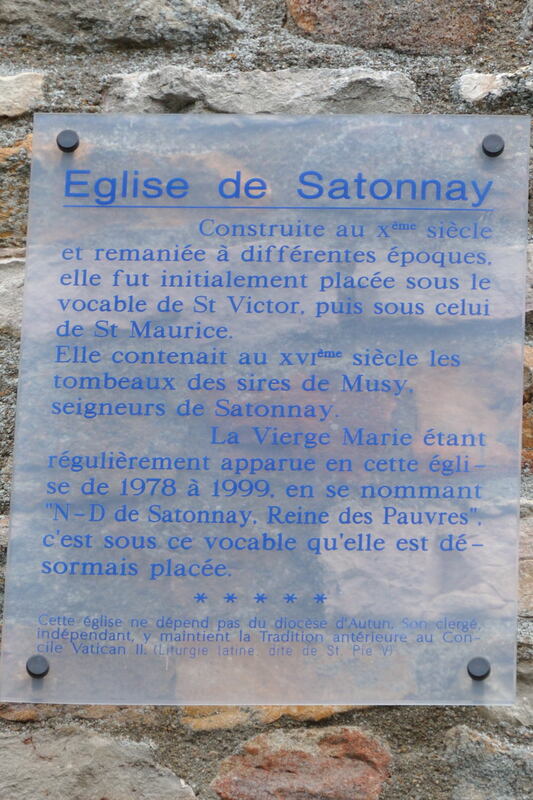 It was originally dedicated to Saint-Victor, then to Saint-Maurice. 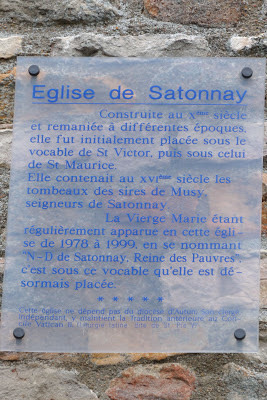 Between 1978 and 1999 there had been regular appearances of the virgin Mary, reason why the church had been re-christened as " Notre Dame de Satonnay, Queen of the Poor". Secondly, and what I found most interesting, was that the church was no longer under the jurisdiction of the Bishop of Autun. The church was run by clergy following the traditions from before the second Vatican Council. It follows the Latin liturgy according to Saint-Pie-V (Pope Pius V, 1504-1572). Paraphrasing the title of one of John Grisham's novels, one could classify this church as a run-away church.